Oral creatine supplements give you energy, but they can cause upset stomach, gas and weight gain. And coffee and energy drinks can cause shaking or have withdrawal symptoms. You won’t have any of these problems with Creatop! Creatop, the first-of-its-kind energizing body spray, is safe based upon years of testing and use. 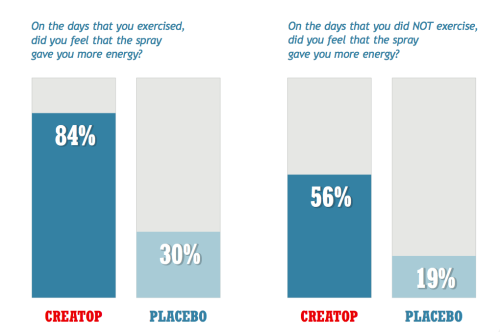 A double-blinded, placebo-controlled study conducted by Schlesinger Associates, an internationally renowned research organization, showed that 84% of the subjects who used Creatop had increased energy. See how this statement breaks down in another one of our blogs. As you can see in this graphic above, 84% of the participants in the study said they experienced more energy on the days they worked out. This is a great result. Feel free to contact us with any questions about the product.